I want to say a HUGE thank you to all those who were involved in Thursday night’s event! My good friend, Sarah Millar, hosted a “Piloxing and Silent Auction” fundraiser to support myself and the thousands of other Canadians diagnosed with Lung Cancer every year. I can’t say enough how grateful I am for the never-ending support and had an amazing time at the event! 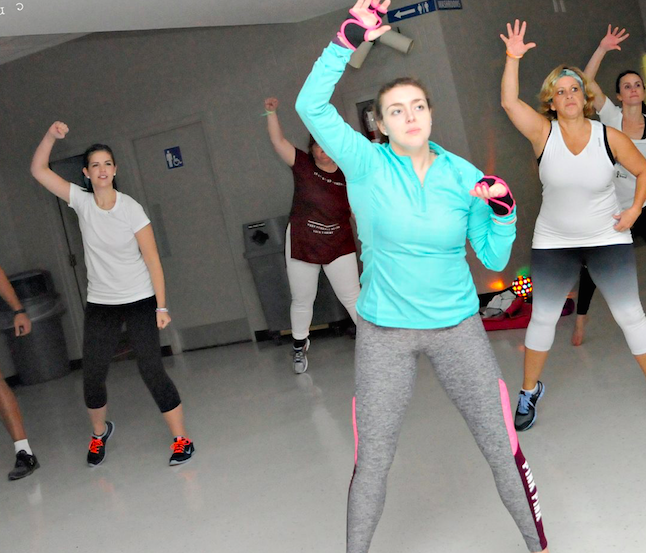 I also have to add, that as a person living with advanced stage lung cancer and currently in treatment, I was able to complete the entire hour long workout class and had a BLAST! (#LIVINGwithlungcancer!!!) I will be presenting a cheque to Lung Cancer Canada on Thursday with the money raised from the “just breathe” bracelets so far and from this fundraiser! November is lung cancer awareness month and you can wear white to help support and create awareness! This month, I wanted to try and create awareness in my own way. I’ve designed my own Lung Cancer Awareness Bracelets that are available to purchase online starting today! ALL PROCEEDS will go to lung cancer research. In addition, I hope to create awareness that anyone with lungs can get lung cancer by having people wear them throughout the month of November (and beyond! ).